Discussion in 'Cross Country, All Mountain & Trail Riding' started by MMcG, May 8, 2008. MMcG Ride till you puke! I've been riding with some new to me tires on my Soul Dillinger (along with some new wheels from Syncros that we'll be reviewing shortly) and so far I'm impressed with this combo. The Dillinger is currently set up rigid and the big high volume Schwalbe Racing Ralph really helps take a bit of the sting out of our rooty rocky trails. Paired up with these Syncros rims, I can run pretty low pressures with tubes and still not really worry about flatting - I'm digging it. I decided to give the Mountain King a try as a rear tire and so far it is also impressing. It rolls pretty fast for being a fairly knobby tire and it has been hooking up fantastically on climbs. So far so good. It also seems to feature tougher sidewalls and so far I haven't had any concers with using it as a rear tire on a hardtail in terms of pinch flat issues. Again - running it at a decent PSI in back so that the ride isn't too "bouncy" in back but still gettting plenty of good grip and pretty respectable rolling resistance. Overall I'm impressed with both tires. Wondering what others think about these tires? Let's hear your thoughts if you have or are currently running them. I finally got to see a set of Racing Ralphs on a bike down here: a 2.4 up front and the smaller on the rear. The rear looked pretty normal, for a big-casing tire, but the front 2.4 was amazing! I have my doubts about how it would work here; our rocks and roots turn slick as snot whenever it's wet . (if we have another drought, though... should I be hoping for such a thing just so I can run a cool tire?) The volume, though, looked perfect. I even think it'll fit on the back of my own bike, but I bet it's close. we've had some 2.4s on order for what seems like forever. they finally showed up at the shop today. that's a lot of meat. Steve - what tire does work well on wet rocks and roots though?? I rode the RR as a front tire in some muddy stuff last SAturday and it didn't really pack up with mud or anything and traction was acceptable in my opinion. Yeah it has a lot of volume to it that's for sure. We'll see about long term durability over the course of the season. i haven't tried the 2.4s yet but i'll toss in some info on the racing ralph in 2.25. i have been running the racing ralph 2.25 up front on my ferrous for a while now. it's set up tubeless on flows. it is a nice tire (e.g. light, decent volume, good traction when dry, etc.). however, i have been able to get it to break loose in the corners a few times when it's muddy/greasy but that may not be entirely due to the tire as cornering is highly dependent on technique. with that said i still wouldn't rely on it if you are looking for a pure mud tire. i do like it enough that i bought two 2.4s which i'll be using on my next wheel project. i was unsuccessful mounting the rr up tubeless with a floor pump initially on the stan's flows. i then put it on with a tube and let it sit for a half hour or so while i did some other things. i took the tube out being careful to only unseat one side of the bead and then was able to get it mounted up with the floor pump. i then used 2 oz. of stan's sealant injected through the valve stem and have not had any problems losing pressure since. comparing the rr 2.25, to the tires that came on my bike the jones dryX tubeless ready in 2.1, the sidewall to sidewall measurement is larger for the jones dryX. 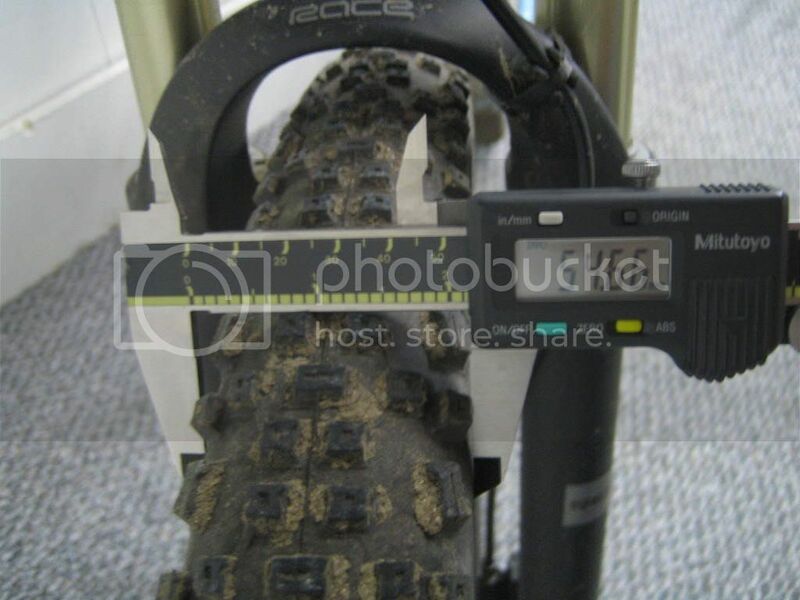 converting the caliper readings to inches would have the jones dryX coming in at 2.2 inches and the rr at 2.15 inches. the rr definitely rolls better though and it is quite a bit lighter. That should turn out to be a pretty damned nice new wheelset/tire combo. thanks. i really like the centerlock system on the 240s hubs and the flows are nice tubeless w/ yellow tape and low pressure. I'm running maxxis ignitors on the front and back and I'm flatting like crazy. Eventually I'll go tubeless...I don't care about weight, but what tires have super beefy casings? I've had a Racing Ralph for a bit, but these Mountain Kings are actually bigger now than the Ralphs. I've set them up tubeless on Flows with Stan's sealant and they are bigger now than when I started out. Sealed up nicely and haven't burped or done anything untoward as of yet. I really like them in the mud where they are one of the better performers I have tried. The Michelin AT XC is still king there though. That said, I think of them much the same as MMcG does: Tougher sidewalls, grippy as all get out. Might not be the ticket on hardpack, as the knobs seem as if they might fold a bit, but in any soil that is soft enough for the tread blocks to pierce into, I bet these will claw up about anything. I'm hoping to hit up some real off camber, hilly, rocky stuff with them soon as I have them mounted on my Hi Fi Deluxe now. Should be a hoot! What's the weight of the Continentals coming in at? 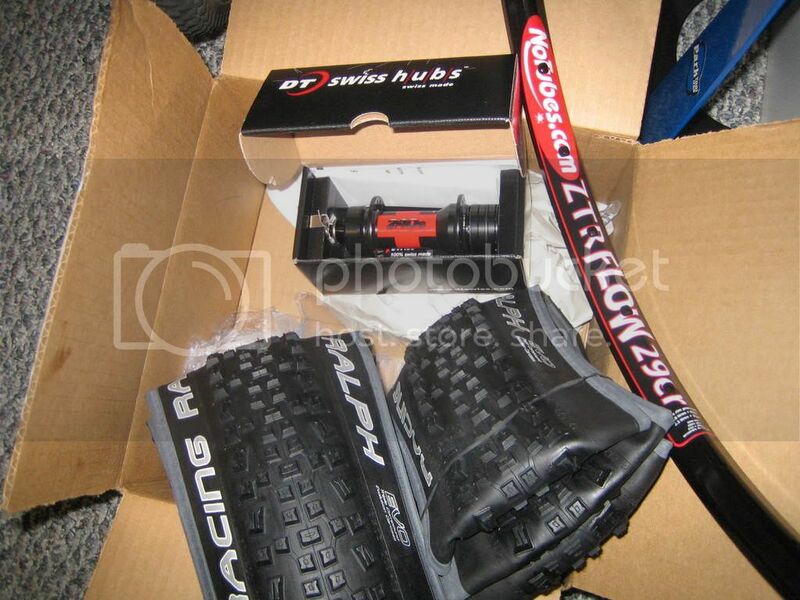 I got a pair of RR 2.4's from the initial batch direct from Schwalbe (at nearly $70 each, ouch!) and I'm really impressed with them tubeless on Arch's on my El Commandante. They're really light and supple. I don't have a scale - but they aren't overly heavy. I think they offer a great balance between, weight, traction, and toughness (sidewalls). Have you tried them in sand? There is alot of hardpack and sand where I'm from. I always think a good mud tire will work well in the sandy stuff around here, and they never do. Here's a pic of the Conti Mt. King now. Side wall to sidewall it measuresbigger now. It was at 52.6mm when I first mounted it to the Flow rims. I have not had the chance to ride it in too much sand, but what little i have ridden it through makes me think that it should work fine in those conditions. my El Paso Texas trip beared tthis out as well. hey thanks for the measurement. I converted your mm measurement to inches:55.30 mm / 25.4 mm/in = 2.18 in. 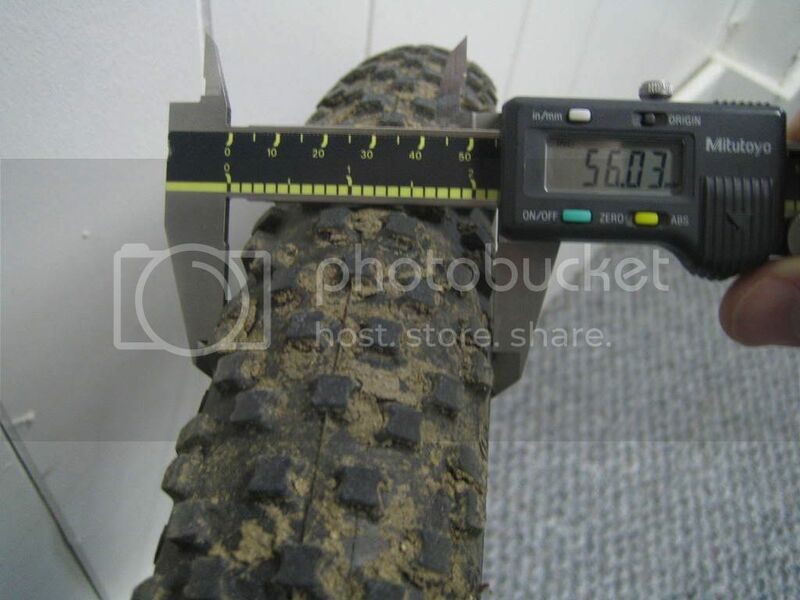 Are those the 2.4 Conti's you measured in the pic? I decided to see if indeed these Mountain Kings do stretch. Pumped em up yesterday to about 55 PSI and I won't be able to ride until Friday at the earliest so let's see if they do indeed "grow" a little bit. Yeah, those are the 2.4"s. Outside knob to outside knob is 60.98mm. So, I suppose it depends on what you want to be "2.4"
I ride the conti on syncros ds 28 rim on a salsa and gf supercal and was impressed with overall performance. it does seem to have a slight bit of drag but cornering(very predictable and smooth transition) and traction are great. I think the mk does better as 29er over the 26er testers I have.